Your Nutrovape will heat the liquid blend to a specific temperature which is then inhaled and absorbed throughout the body. How will I know my Nutrovape device is finished? You will know if your device is depleted of oil when the green light at the end is flashing, or there is no vapor being produced when inhaling. Negative Ghostrider! An E-Cigarette contains nicotine where as nutrovape DOES NOT contain any NICOTINE or TOBACCO. Instead Nutrovape devices contain the highest grade nutritional supplements sourced from the United States. How quickly do you feel the effects of Nutrovape? Is there an age restriction to use Nutrovape? 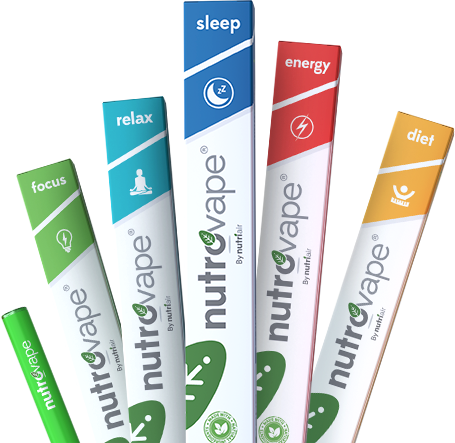 Nutrovape is a nutritional supplemental aid with NO NICOTINE or any other harmful ingredients. We recommend Nutrovape users be ages 18+ and it is not recommended for pregnant or nursing women, or people with respiratory illnesses. How long should my Nutrovape last approximately? Usage varies per product, and of course everyone inhales differently. If used accordingly, a Nutrovape should last you 1-3 weeks. However, if you are using your Nutrovape sporadically, for example, items like Nutrovape Energy or Sleep. A Nutrovape can last from 40-60 days. No! We designed Nutrovape to last conveniently without carrying charging devices. Fits perfect in your pocket, purse or luggage for your on-the-go lifestyle. Can I travel with my Nutrovape? We wouldn't DREAM of leaving home without it! Place it in your carry-on just make sure you are not using it while on an airplane. We have both domestic and international shipping available. Please be aware when using international shipping, delivery can take up to 20+ days to be received due to a country's customs. Unfortunately, we do not have control of what happens to the shipment once it has left the United States. Certainly. When placing an order, we will automatically send you a notice that states your order is fulfilled and the package is on its way to you. From there, you will automatically receive a tracking number, which will provide you the most updated package information and the estimated time of delivery. For any reason that you do not receive a tracking number, please contact help@nutrovape.com and we will ensure you are taken care of.